Legendary jazzman, Armenian-born People's Artist of Russia, George Garanian died at the age of 75 this morning. The death from cardiac arrest happened on tour in Russian city of Krasnodar, George Garanian’s wife Nellie Zakirova told journalists. George Garanian was one of the first Russian musicians who attracted attention of Western world as part of the "jazz from the USSR". He belonged to the first generation of Russian jazzmen who started to perform after the World War II. As a musician (alto saxophone), conductor and composer he always was among the best musicians. He was the leader of country's best big bands: "Melodia" (70s - 80s), Moscow Big Band - 1992-95. He led the Municipal Big Band of Southern Russian Krasnodar city. 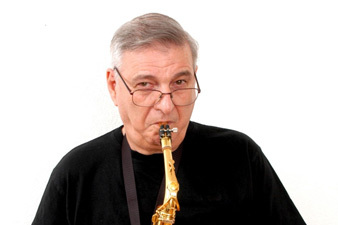 Garanian recorded more music than any other jazz musician in Russia; he performed at numerous international jazz festivals and toured Germany, USA, Japan, Australia, Sweden, France and many other countries. "George Garanian is phenomenal,” said famous American critic John Hammond, who heard George at the jazz festival in Prague.